When I told locals that I was going to be visiting the Punta Gorda area, they all looked at me wondering, why? They told me it was boring and I shouldn’t bother. It seems the entire district of Toledo is unexplored territory. It’s an off the beaten track destination in the heart of traditional communities. 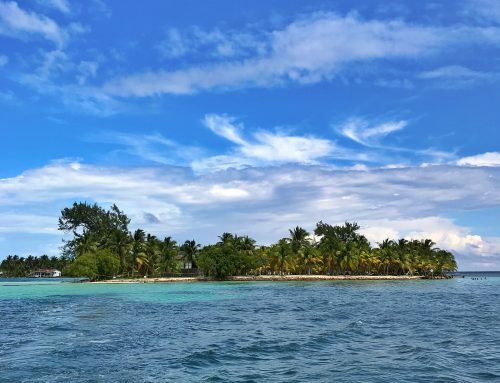 What many don’t realise, its the next place in Belize to become a hotspot for tourists, due to its many hidden treasures. All it will take is an article in a couple of big publications and boom, the hidden gems will no longer be. 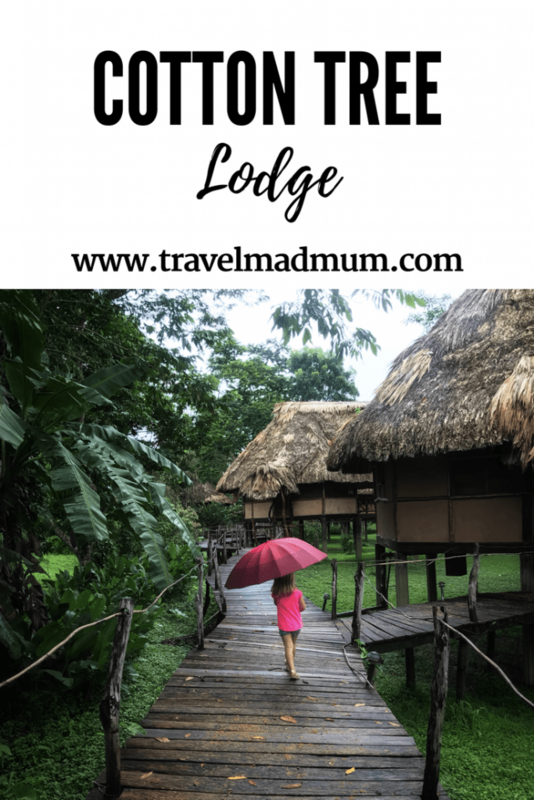 One of the accommodations in the area is, Cotton Tree lodge, it’s in the middle of the jungle and takes some 45 minutes from the main highway, on a gravel road to reach it. 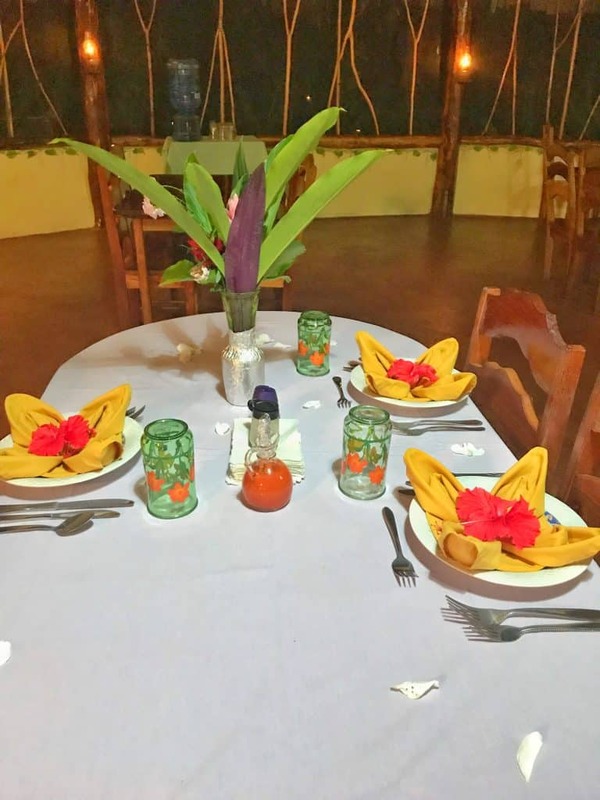 Based between two Mayan villages, Cotton Tree Lodge has the community at heart. It employs many of the local people, making the experience all the more authentic for guests. The owner, Jeff and his management team, do a lot more by working with non-profit organisations to support sustainable agriculture. 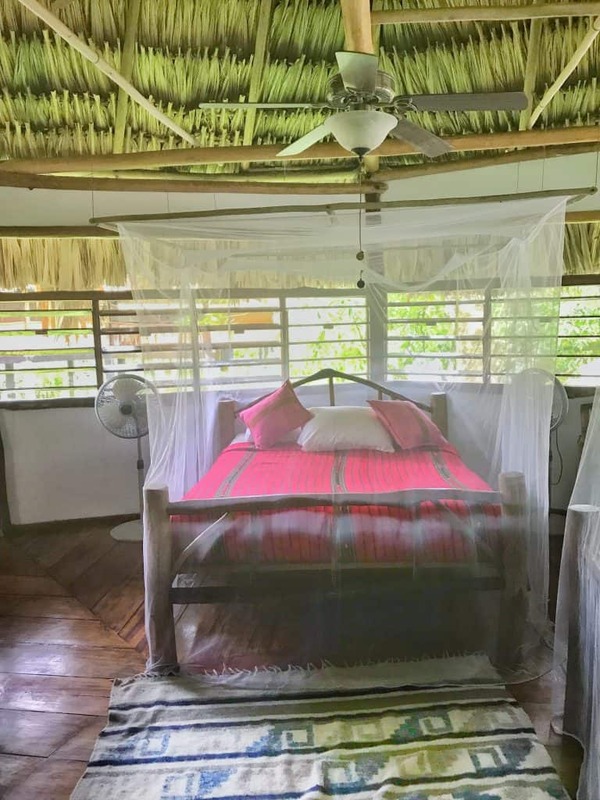 With this record, it goes without saying, Cotton Tree Lodge is at the forefront of Eco-tourism in Belize, along with Chaa Creek. For a true jungle experience, in the most eco and environmentally conscious way, Cotton Tree Lodge is the place to be. This is a wild experience and I mean that quite literally. There are creatures everywhere and it will take the type of person that can embrace it to really enjoy it. 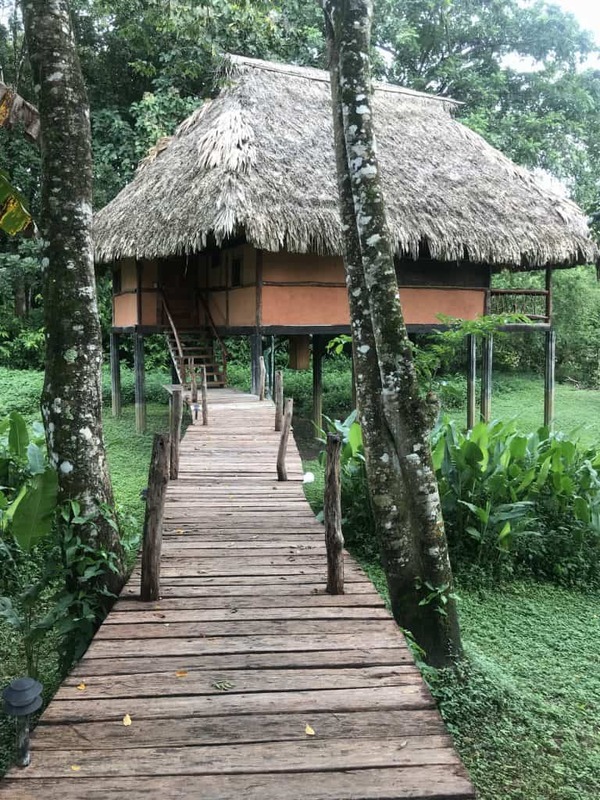 Based on the banks of the Moho River, are several cabanas in a variety of styles and a large lodge. The site also includes an organic garden, a farm, spa / massage area and of course, a gigantic cotton tree. 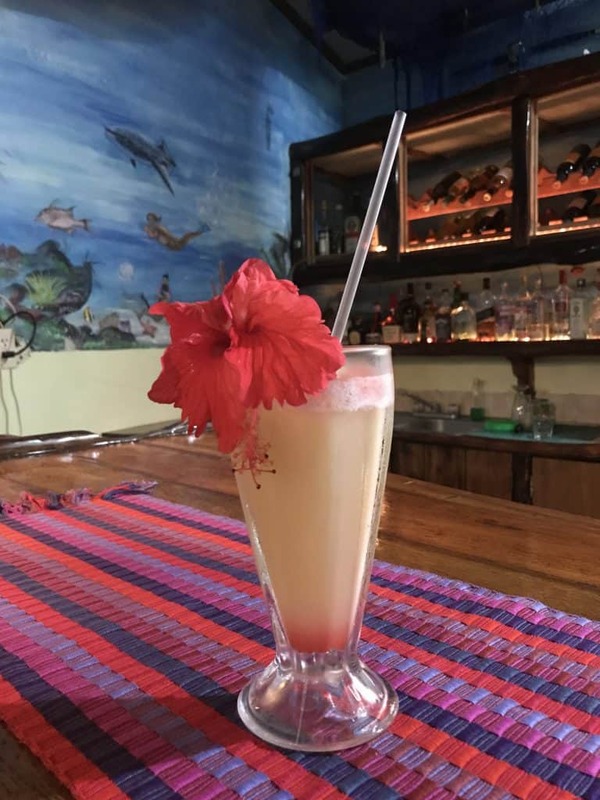 In my usual format, this is my play sleep and eat review of Cotton Tree Lodge, based in the beautiful Toledo District of Belize. 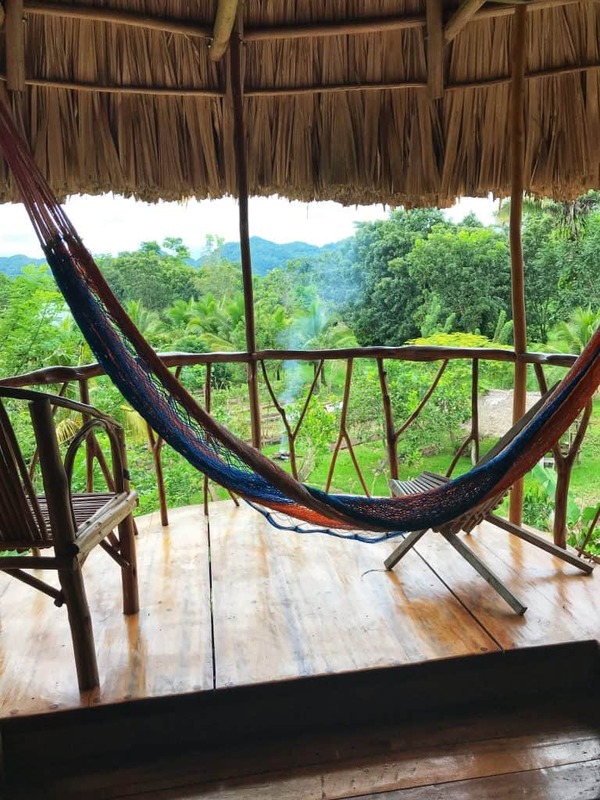 Being in the jungle and hearing the wildlife all around makes for a relaxing environment. Like I said on Instagram recently, its like the CD that plays over and over again in the massage parlour, accept its real. Birds chirping, rain dropping and water moving. 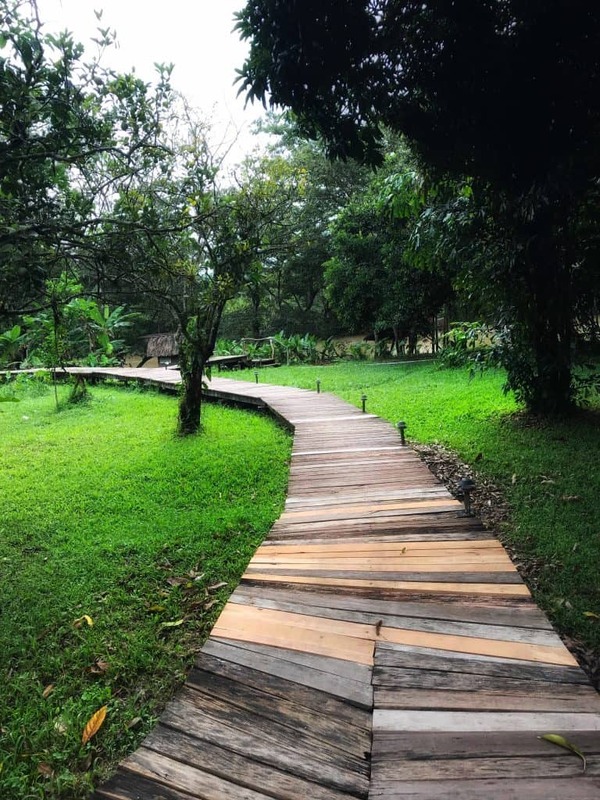 Cotton Tree Lodge, along with their Yoga and Spa Therapist Parama offer all guests a complimentary ten minute massage. Based on the top floor of the Garden Vista, the room is extra special with incredible panoramic views of the mountains. Parama chats to all guest, discussing any aches or niggles to be worked through during the session. The room is light and airy. I have had many massages, but I can safely say it’s the first time I had a therapist thank the spirits of the jungle and ask them to look over me as an opening to the session. I found it quirky and I liked it! Beyond the ten minute intro, there is an entire book full of treatments on offer at a cost of around 100 USD. In addition to the massage Parama runs daily morning yoga classes. I had every intention of attending but my two kiddos were keeping me busy at 7am. I do feel I missed out! That said there is a free nanny service on site. As I was nursing, we didn’t take up the offer but we did meet the lady and she seemed like a very lovely and gentle person. 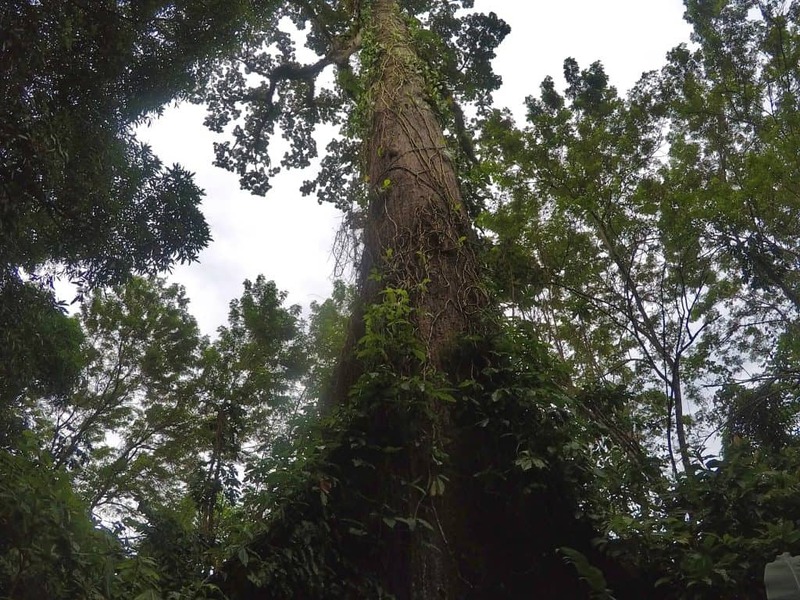 They offer quire a few ground tours including a jungle survival course and nocturnal wildlife tours. Both are run by the lodges very own Gardener who has a military background. They also offer horseback riding, sunset river cruises and bird walks. We were there during rainy season so the river was flooded. Luckily there are plenty of local tours that are suitable or that time of year. I really admire Cotton Tree Lodge for taking tourism right to the door of locals in hard to reach areas. It’s amazing the people can benefit from the industry in their own homes. One of the local tours, involves visiting a local woman known as Ms.Bo. She takes tourists in and teaches them how to make tortillas from scratch. She’s great with kids and our three year old got stuck in. 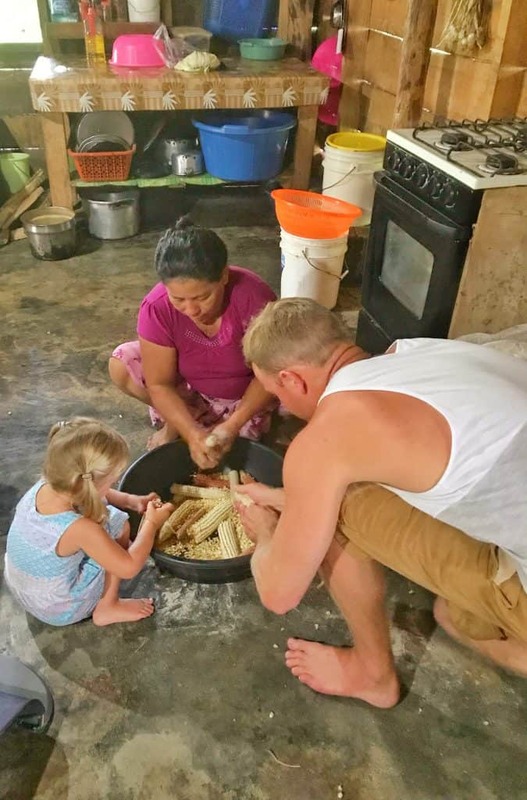 She was sitting with her taking all the corn kernels of the cob, washing it, grinding it and then making it into a tortilla before cooking it. Afterwards, she served up our work of art along with some accompaniments. Another tour involves a cultural drumming lesson with local Creole community. Belize has an incredibly diverse population, it was amazing to see. The drumming lesson is most suitable for kids that love music. They are quite good at involving them. 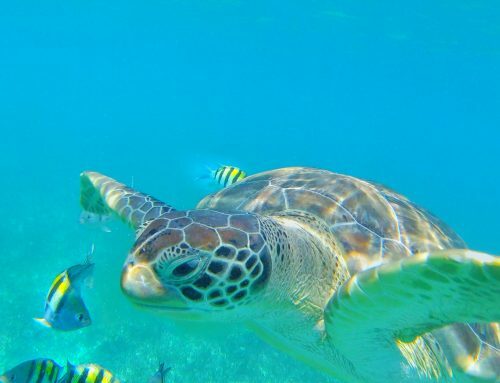 For the more adventurous there is also plenty of things like kayaking, fishing and cave exploring to name a few. There are several different types of cabana’s at Cotton Tree Lodge. Everything, from a honeymoon to a standard cabana are available. We had a deluxe which had two double beds. 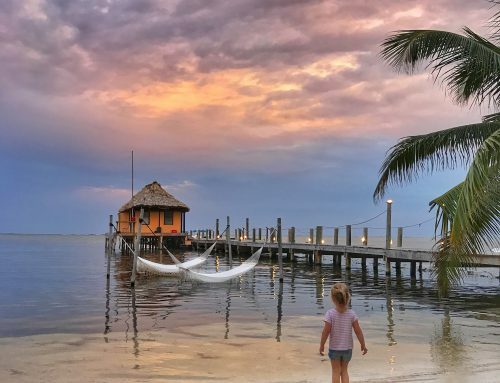 It worked good for us as we co-sleep with our kids but there are also family specific cabana’s. Most of the accommodation is based on the edge of the river. As you can imagine its full of life. We quite often heard a big splash and also got to see massive iguana’s hanging out in the tree next to the cabana. Our beds had mosquito nets around them and they were most certainly needed. At night time there were many mosquitos and other bugs around. It’s really important to bring a good bug spray. That said, once we got cozy, I had such a good deep sleep. The beds were comfortable and the natural white noise was soothing and relaxing. The cabanas are kind of open in a way. Rather than glass windows, there is a mesh that stops insects from coming in. So as you can imagine, it really felt like we were right amongst nature throughout the night. Our little deck had two hammocks. This was by far the most relaxing spot. They were super comfy, we just got lost in them each afternoon. We listened to the monkey’s hollering and the birds chirping. The staff are keen to maintain the eco vibes and educate guests on how they can help. They have water dispensers dotted around to save on plastic bottles. We were also given info on the way the electricity works onsite and encouraged us to turn off everything when we left our cabana, basic but important. The food at Cotton Tree Lodge is super fresh. In keeping with the eco spirit, they always like to serve at least one thing on the guests plate from the garden. They have an organic garden onsite and grow everything from eggplants and lettuce to beans and celery. The food is not super fancy but I would describe it to be more like home cooking. They make an extra special effort with table setting, especially with the flowers from the garden. Maria, the chef, has an open kitchen so guests can watch the food being prepared if they like. Breakfast included an overflowing plate of freshly chopped tropical fruits, pancakes, tortillas, coffee and cold juice. The portions were big and certainly set us up for a day of touring. The lunch menu was simple, burritos but the nice thing was the flour tortillas were made there and then. It was so noticeable how fresh they were. At dinner, the meal included four courses, an appetiser, salad, main and dessert. On our first evening I really enjoyed the shrimp curry. The flavours were incredible. It’s the kind of food mum makes, comforting and good. Besides the delicious freshly cooked meals, the bar also had an array of beverage choices. Being with two kids, we didn’t go too crazy but we did sample one of the Pina Colada’s. We all know pineapple juices is a main ingredient and I am pretty sure it was freshly juiced. That says a lot! Anything different for next time? We enjoyed our stay at Cotton Tree Lodge. The only one downside was the time of year we travelled. When we return next time we will make sure its in high season to see everything including all the activities in all swing. Disclaimer: Our stay at Cotton Tree Lodge was complimentary. In return, we have written this honest review. As always, all views expressed our entirely our own. Great article! They just reached out to me so I’m trying to do some research before I agree to the stay! Im concerned that I might be pushing too close into the rainy season, what time of year did you go? And did you feel like you missed out on a lot because of rain? Thanks for your help! !